Sometimes, when adventuring, i stop and grit my teeth and wonder if i am going to make it back. That is when i know what it is to be alive. The combined drop of the multitude of the segmented falls of the Oberon Plateau is about 370m (1200'). 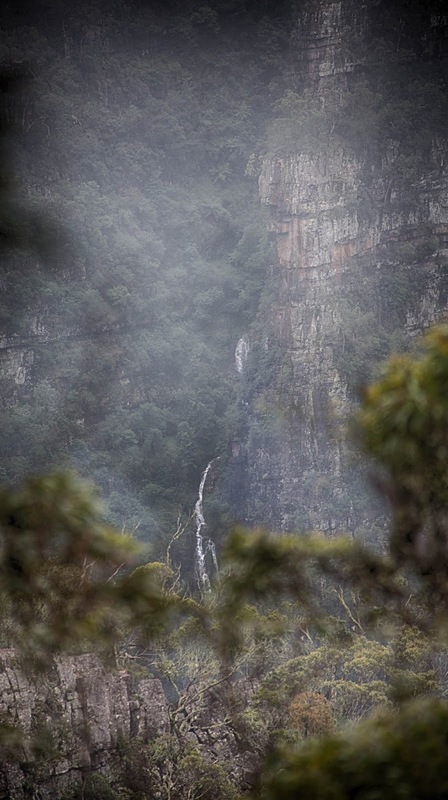 However, some of the water here falls 420m (1400'), higher than all but two of the NY skyscapers. 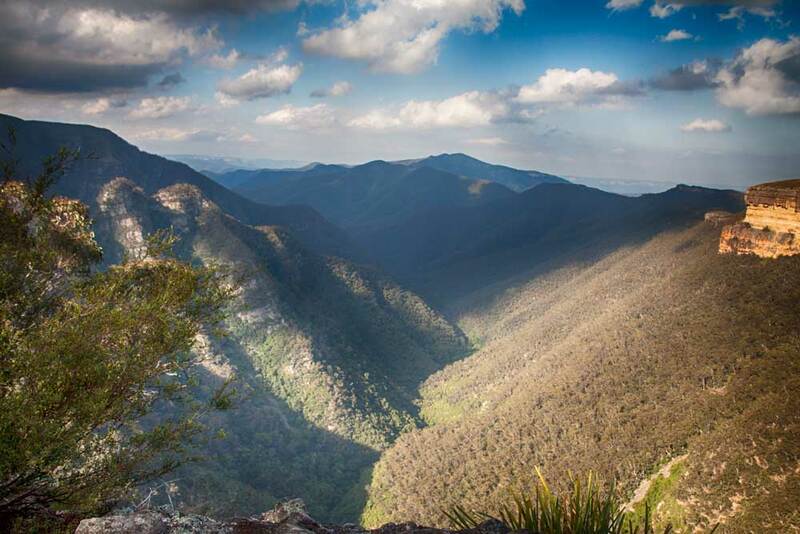 The top of the Oberon plateau is about 3,400' with high point 4,000'+ the bottom of the valley is 2,000'-1,400. After heavy rain, every gully hosts a fall. The First People of the Oberon Plateau, the Gundungurra, knew things we do not. They knew the ancient name of the rivers and the falls, they knew how to survive in impossible conditions, and they knew a medicant that, rubbed onto the body, protects it from extreme cold. "Having previously made a large fire, they all went to sleep on the lee side of it without any article of covering. Nature appeared to compensate in some degree for this want with a covering of hair, which was particularly observable in the very old ones.. They appeared to suffer little or no inconvenience from change of weather, for they continued fast asleep during a violent shower of rain that lasted three hours, the thermometer standing at 39 (4 degrees centigrade)." Kant resisted calling such a place beautiful. Instead, he called it an "outrage on the imagination" - sublime. I first felt this in the morning time here, after a walk on the clouds: the joy of being alive. For many years i closed my eyes to the beauty of the bush, pursuing a career single-mindedly. Since then, I have realized that careers are not that important. Australia's bush poet, Henry Lawson summed it up in "Clancy of the Overflow". But I doubt he'd suit the office, Clancy, of ‘The Overflow’." There is no easy way to take pictures of the Thurat Walls falls, let alone apply any skill in composition. I was drawn to them by the sound of the tumult, and remember seeing them as a flash of violent lightning across the abyss. 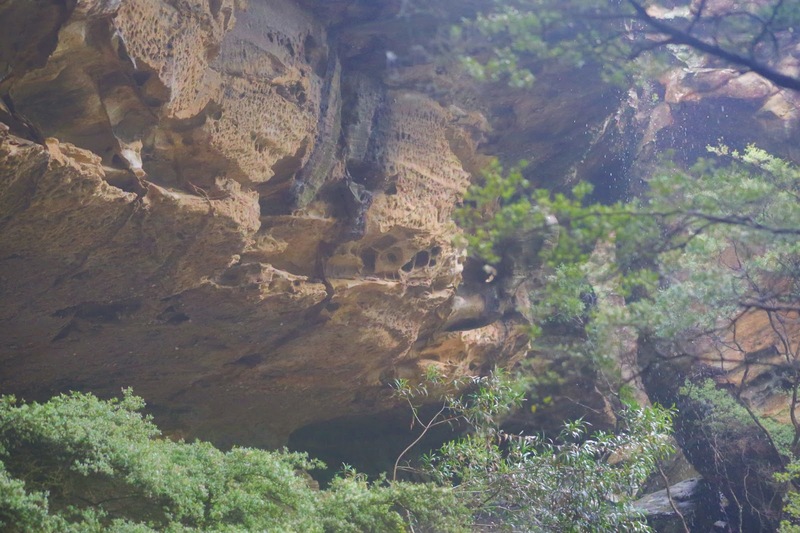 This image has been sewn together from multiple images taken in rain through a forest of wattle on the edge of the 370m (1200') cliffs. After heavy rain, every part of the plateau is awash. 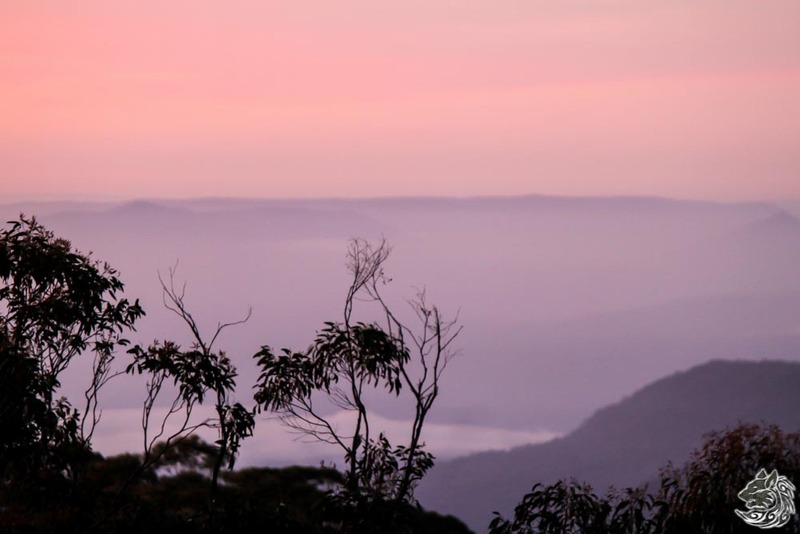 Some say this place is one of the most impressive Australia has to offer. It defies imagination and kicks away the supports we build to hide the world from us. 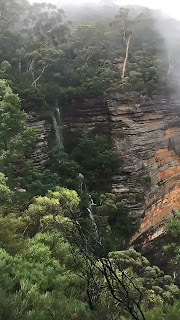 The top two plunges of this remote 380m (1250') segmented fall in the southern Blue Mountains taken from a vantage point along the climb down to the nearby Kalang Falls. Only birds get to see the entire fall. 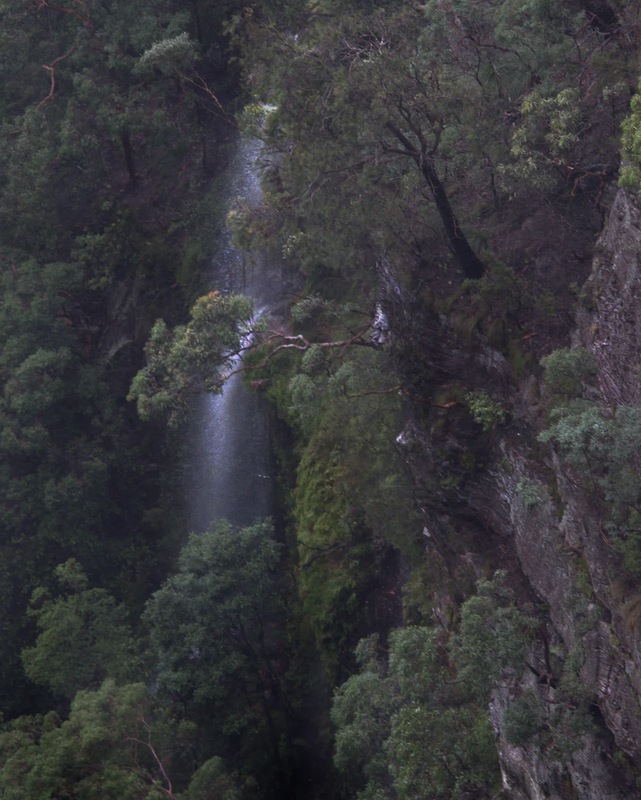 Image: A single shot in light rain and mist from an adjoining ridge (which obscures the lower fall). The shot has been slightly dehazed and toned for structure and depth. The path of the falls maintains a healthy ecosystem for ferns and moss. 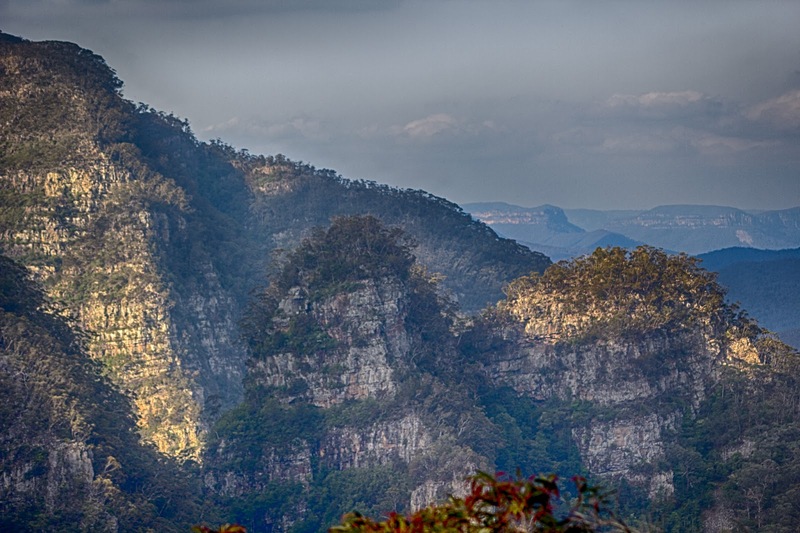 There are a number of segmented falls in precipitous succession: 150m, 25m, 50m, 12m, 75m, 45m, 10m, 10m, 10m. 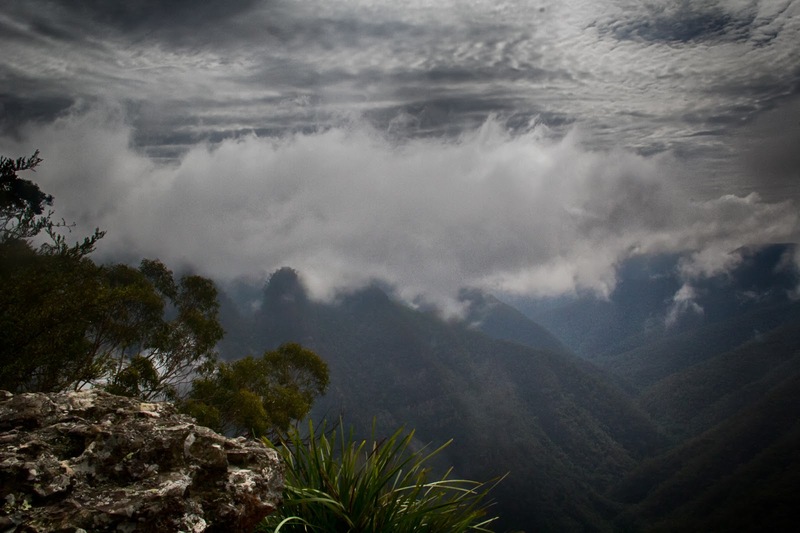 The wilderness escarpments from Kanangra Walls to Mount Cloudmaker drop precipitously. 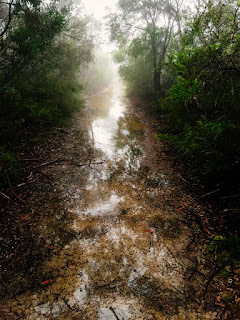 When it rains the top of the escarpment fill ankle deep in water and you seem to be walking on clouds. Waterfalls can be heard in profusion but decent vantage spots are far and few between. 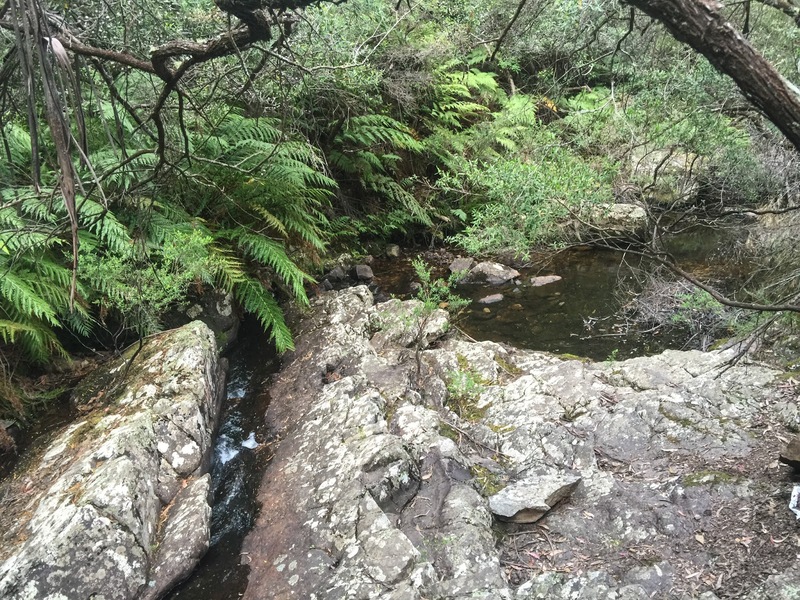 This protected gully holds the plunge pool of the Kanang Creek Fall (only partly visible). Access to this vantage requires an exposed climb along metal ropes. The older rocks (mid-bottom of the falls) date from the Devonian Period (400m years ago). Imagine a place so remote that very few have ever seen it. 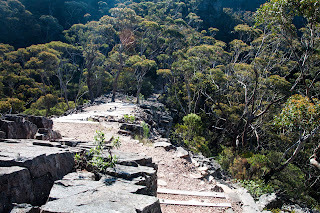 There is a cave at the bottom of the escarpment large enough for three tennis courts. 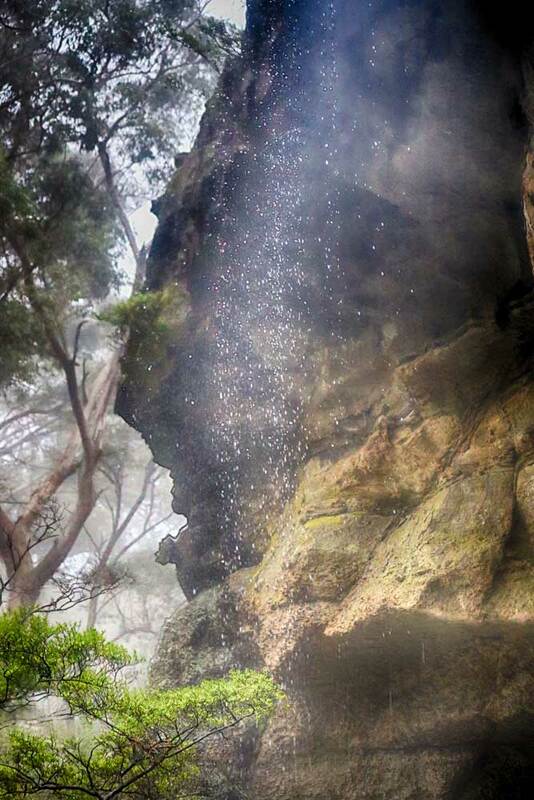 The cave entrance is protected from the elements but is open to the sky, and a curtain of waterfalls create a wall of water you must pass through to enter. The cave itself extends back some distance, far enough to be dry. You can camp here and light a fire. 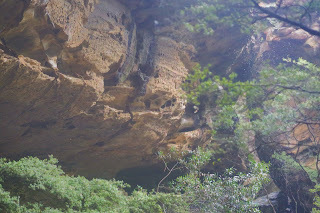 Once, people danced on the floor of the cave (early European settlers built a wooden dance floor here). 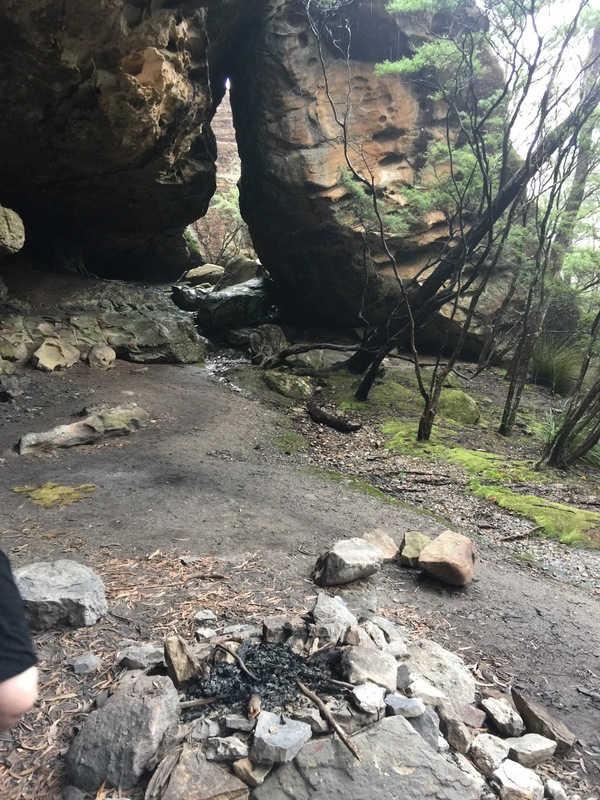 The settlers are all gone now, only the cave and the waterfall remain. In the reflected light of a fire at night, the waterfall looks like stained glass in a great cathedral. 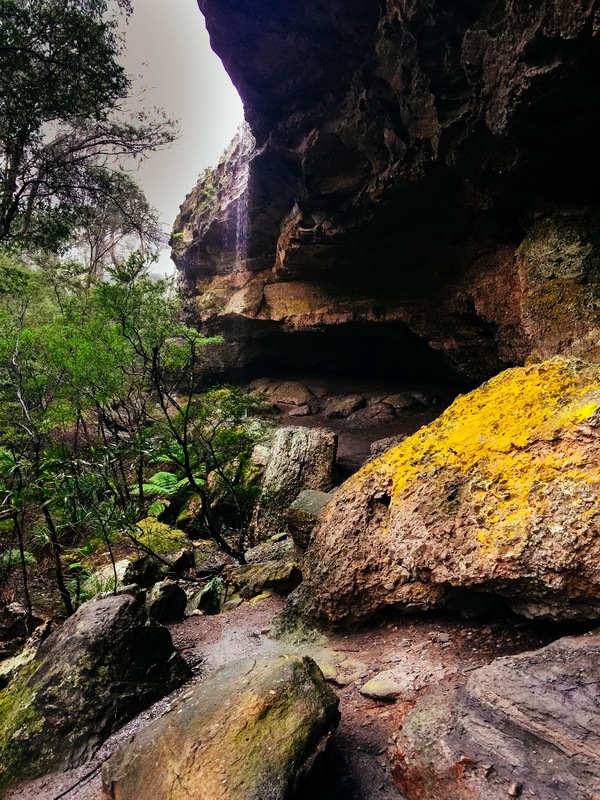 I am fond of this place, and have used it to tell the story of Hanora. People once lived here, in this remote place. 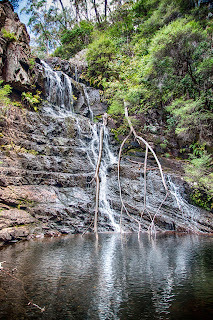 Intermittent fall, sometimes called Demeter Falls, starting her plunge to the underworld. Until the great destroyer takes us back whence we came." 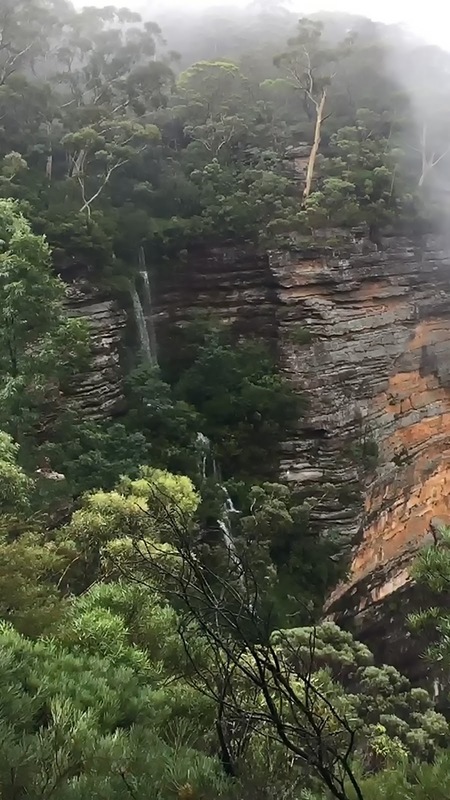 All small escarpment falls wake after rain. 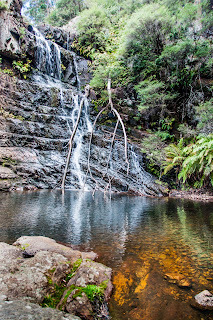 A while back, i set myself the whimsical notion of visiting some of the 15,000 falls of SE Australia. 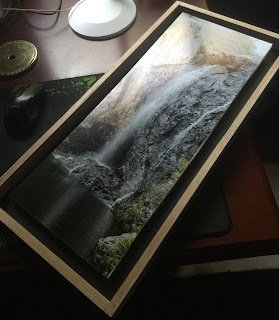 Of these about 300 are named and perhaps 1,500 are shown on topographic maps (topographic maps are a poor way of finding falls). Surprisingly, i find most falls on public land and while many are surrounded by private property, the creek/river and falls were retained in public ownership by the original surveyors. Lots, like this one, remain unnamed in our present era. This is a still from a video taken in mist and rain. It is perhaps typical of many of those other unnamed falls - but i can assure you that while the image is misty, the sound of the fall was loud. 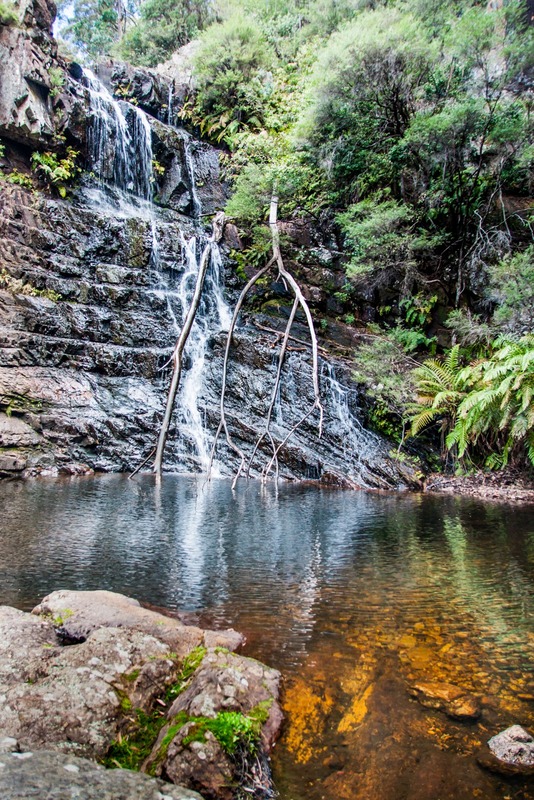 Many of the falls noted in this article are inaccessible (save by experienced abseillers) and are intermittent. 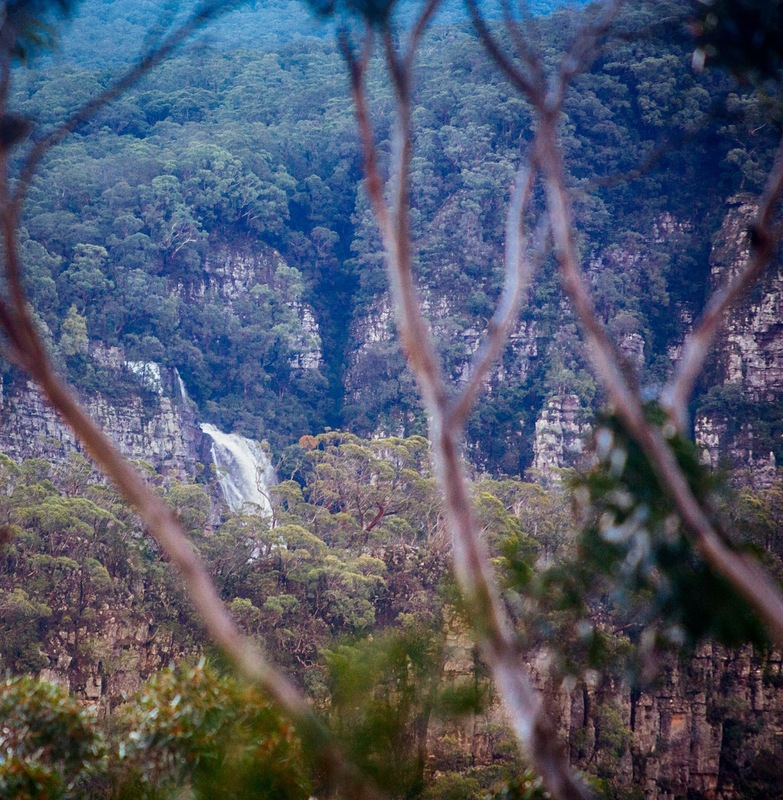 An exception is Kalang Falls, which trail is rated 'hard'.